Philip Guston's cartoon paintings...retain a startling freshness allied to abiding classicism...with stolid scenes of Klansmen that combined Piero della Francesca's Renaissance modeling with the social conscience of Mexico's radical muralists. 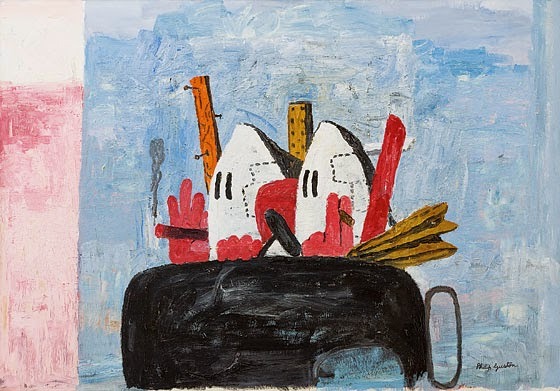 Then came the lush abstractions that made Guston famous, and finally the late figures, which harked back to the Sunday comics he'd loved in his youth. The first exhibition showcasing his mature style, in 1970, was generally panned; Guston's newfound crudity was compared to the work of R. Crumb, a cartoonist the painter claimed he'd never heard of, but who shared the same big-foot comic-strip influences. Willem de Kooning, however, understood Guston's breakthrough [Guston: "I got sick and tired of all that Purity! I wanted to tell stories. "], telling the younger artist: "Well, now you are on your own! You've paid off all your debts!" Indeed, the gorgeous Edge of Town (1969) blends the absurdity of Guston's newfound characters with classical monumentality and the wet-into-wet cross-hatching of his elegant abstractions, creating a sui generis amalgam of image, mood, and materials. The beefy pink flesh of dangerous buffoons in white hoods, waving clubs and fat cigars as they cruise about in a pathetic black jalopy, is set against a sky of smoggy blue and rose leavened with the dark flecks of an earlier, painted-over composition - an imperfect foundation as flawed and dynamic as America itself. This is a transitional painting filled with struggle and conviction, the kind of work that leaps over everything else in its time to become timeless.